OST files or Offline Storage Folders saved in user's system are a duplicate copy of user's Exchange Mailbox. Each and every OST file is associated with a particular Exchange mailbox and cannot be used with any other mailbox. Hence, a user cannot use an existing OST file with a new mailbox after migrating to another Exchange Server. Thus, prior to migration, if you wish to find the user mailboxes associated with OST files or look out for information within OST files, this utility saves you innumerous hours by showing the users storing offline data. 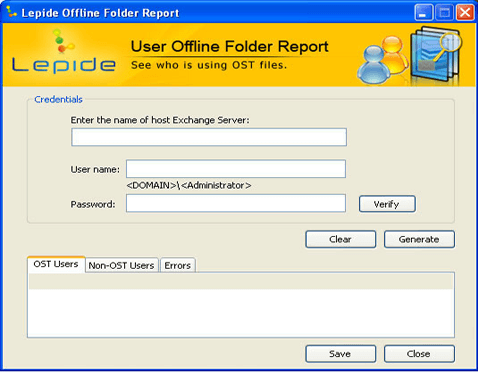 Provides offline folder report showing OST and Non-OST users. In just four steps we can provide you with the report you need. 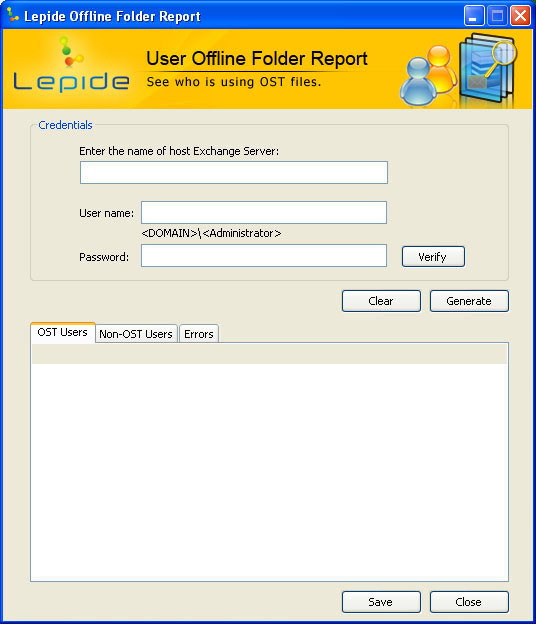 Install and launch Lepide Offline Folder Report solution! Enter host Exchange Server name and administrator credentials! Validate the credentials by clicking on ‘Verify’ button! Click on ‘Generate’ button to create report of OST users, Non-OST users and error list!